Today is the 125th birthday of Juan Gris, the Spanish painter and also the third Musketeer of Cubism. 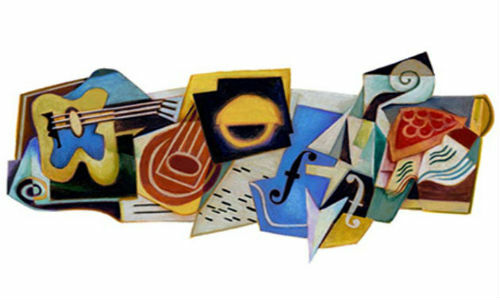 Google has painted a cubist doodle on its homepage across the world. José Victoriano González aka as Juan Gris (pseudonym) was born on March 23rd, 1887 in Madrid, Spain. He passed away on May 11th, 1927 in France. His paintings will reflect the Spanish roots. The doodle today is an abstract art of Cubism that was the most revolutionary art movement of last century. The guitar is a recurring theme. Even the fruits and newspapers are recurring. For this reason, even the doodle today is having these three elements. Google often celebrates the noted painters. The legendary painters whose birthdays were observed on Google homepage include Leonardo da Vinci and Vincet van Gogh. The doodle today is the 1340th doodle as per the records. The first one was posted by Google in 1998. All these doodles can be seen in the official doodle website and also purchased from their.